What a convenient way to eat or drink on your couch! This beautiful cappuccino finished hollow-core accent table has sufficient space for you to place your snacks, laptop, tablet as well as offering a large storage drawer for remote controls, magazines, etc. Its chromed metal base provides sturdy support along with a fashionable touch that will suit any decor. What a convenient way to eat or drink on your couch! This beautiful cappuccino finished hollow-core accent table has sufficient space for you to place your snacks, laptop, tablet as well as offering a large storage drawer for remote controls, magazines, etc. Its chromed metal base provides sturdy support along with a fashionable touch that will suit any décor. This beautiful cappuccino accent table is a great addition to any living or family room. With sufficient surface space for snacks and drinks as well as a convenient storage drawer for remotes, coasters and other accessories this table is perfect for movie night, snacking in front of the TV or entertaining guests during the big game. With its modern cappuccino finished top, this plant stand gives a warm feel to any room. Its silver coloured metal base, with a criss-cross motif, provides sturdy support as well as an elegant look. Use this multi- functional stand to place your favorite plant, and its lower shelf to display decorative pieces. It will be a sure eye catcher! This beautiful dark taupe reclaimed-look accent table is a great addition to any living or family room. With sufficient surface space for snacks and drinks as well as a convenient storage drawer for remotes, coasters and other accessories this table is perfect for movie night, snacking in front of the TV or entertaining guests during the big game. This beautiful glossy grey finish accent table is a great addition to any living room, family room, or home office. With sufficient surface space for snacks, drinks, or tablet as well as a convenient storage drawer that slides out on either side for remotes, coasters and other accessories, this table is perfect for movie night, snacking in front of the tv or entertaining guests during the big game. The chromed metal base provides sturdy support along with a fashionable touch that will suit any decor. Accent Table - Cappuccino / Chrome Metal With A Drawer What a convenient way to eat or drink on your couch! This beautiful cappuccino finished hollow-core accent table has sufficient space for you to place your snacks, laptop, tablet as well as offering a large storage drawer for remote controls, magazines, etc. Its chromed metal base provides sturdy support along with a fashionable touch that will suit any decor. Accent Table - Cappuccino / Chrome Metal With A Drawer is rated 3.7 out of 5 by 3. Rated 5 out of 5 by vanny from just kidding! PSA: Don't try putting together furniture while suffering sleep deprivation from a 3 month old! Please disregard my previous review. Unfortunately, I can't revise/delete it. Table went together well and seems reasonably sturdy. It should work well provided my kids don't try to use it as a diving board onto the couch. Rated 1 out of 5 by vanny from Nothing fits together! I'm flabbergasted by the previous comment. Nothing lines up! Even if they did, the cross braces have channels instead of holes so I have no idea how the screw could even connect them to the sides. 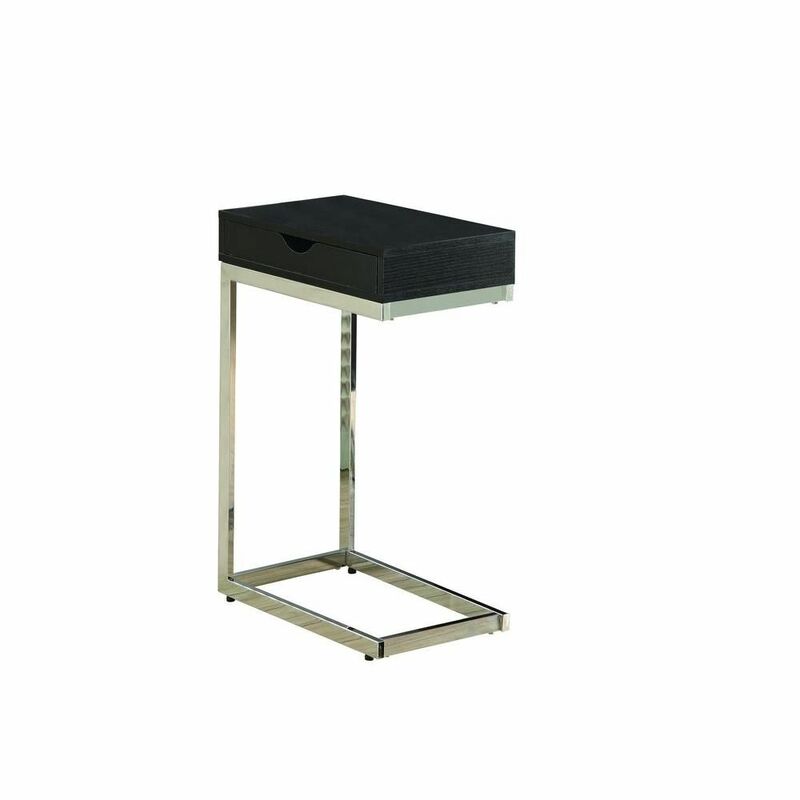 Rated 5 out of 5 by PK from Metal and wood "C" table This end table is pretty good quality and it is rather easy to assemble. All the connection holes align properly and there is no misfit parts.